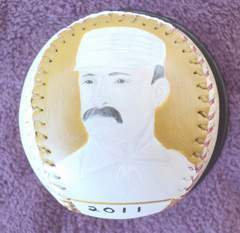 This Great American 300 Wins Baseball features three of my original paintings. A certificate of authenticity comes with your baseball so that you know it's an original Great American Baseball. 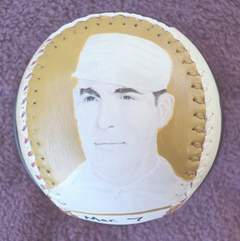 Side one is my close up painting of Mickey Welch who finished with 307 wins. Click here for a closer look. Side two is my painting of Tim Keefe who ended with 342 wins. Click here for a closer look. 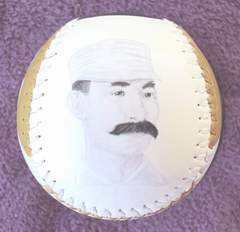 Side three is my painting of Charles Radbourn who won 309 games. Click here for a closer look. 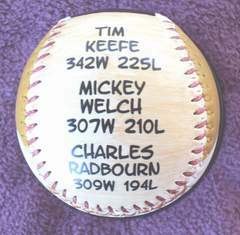 Side four shows the career won loss records for these 300 game winners. 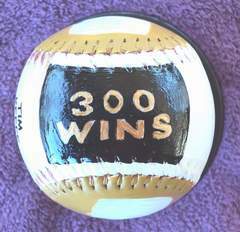 Side five, which is the top of the baseball, has 300 WINS hand painted in black and gold. 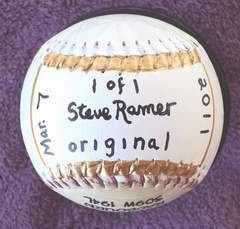 Contact Me To Purchase This Baseball or use the Pay Pal button below.